The labor market maintained a healthy pace of growth in October. In addition, a vigorous rise in wages and upward revisions for the previous two months point to economic growth that will sustain positive forward momentum. Coming after the strong third quarter GDP number of 2.9 percent, October’s employment data reaffirms the underlying strength of the national economy and signals a high probability that the Federal Reserve will lift its benchmark lending rate in December. U.S. employers added 161,000 positions in October, and hiring totals for the preceding two months were revised upward by 44,000 jobs, which suggests stronger employment trends for the coming months. Year to date, the economy has averaged 181,000 positions per month and remains on track to add about 2.2 million this year. Service industries are leading the labor market so far this year, especially healthcare as well as professional and business services. The current labor market expansion has been the steadiest economic barometer since the end of the recession, and maintaining a monthly pace of 150,000 jobs will absorb new entrants into the labor force as well as whittle away labor market slack. The unemployment rate receded to 4.9 percent last month and other measures of the labor market also improved. The underemployment rate of 9.5 percent marked the lowest level in more than eight years, while the average hourly wage increased 2.8 percent from one year ago, the fastest rate of growth since 2009. U.S. employers are competing more vigorously for workers as labor market slack abates. 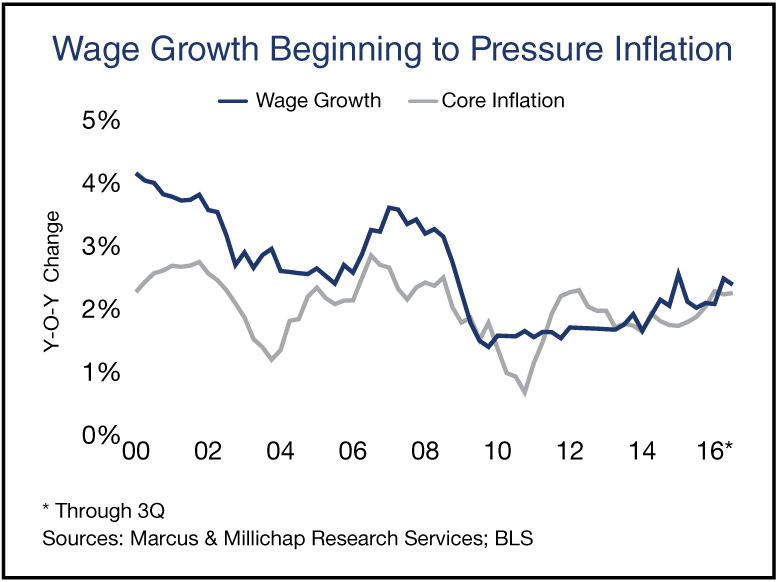 Additional wage increases could accelerate inflation and economic growth, encouraging the Fed to normalize monetary policy more quickly. Growing wages will potentially drive spending during the upcoming holiday shopping season and support a higher pace of GDP growth during the current quarter. The Atlanta Fed upwardly revised its fourth quarter forecast to 3.1 percent on the heels of the October employment report. Retailers are benefiting from strong consumer spending trends and keeping U.S. retail properties full. Vacancy in the retail property sector is on track to fall 40 basis points this year to 5.6 percent. Household formation during this growth cycle has favored renting rather than homeownership, pointing to a shift in lifestyle and barriers to homeownership. As a result, apartment developers have ramped up construction, and builders will complete 320,000 units this year, the highest annual total since the 1980s. Healthy net absorption will keep vacancy near 4 percent through the remainder of the year. Hiring momentum and rising wages will contribute to the creation of new rental households. Growing demand will push down the U.S. apartment vacancy rate to 3.8 percent this year on net absorption of 354,000 units and support a 4.5 percent gain in the average rent. Completions will hit a cycle high of 320,000 rentals in 2016 and peak at 371,000 units next year. Supply growth will pressure vacancy in a few major metros, although net absorption will remain elevated and minimize the impact on vacancy. This entry was written by marcusmillichap, posted on November 4, 2016 at 9:52 pm, filed under Uncategorized. Bookmark the permalink. Follow any comments here with the RSS feed for this post. Post a comment or leave a trackback: Trackback URL.